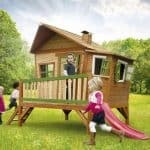 The incredible looking BillyOh Mad Dash Annex Log Cabin Wooden Playhouse is one of the most jaw dropping playhouses on the market right now. This playhouse offers the kids a whole lot of room to play, organise their toys and even have their own little furniture like tables and chairs so they can invite their friends round for tea. They also have an upper level that they can play on as well which is reached via a child safe ladder. The playhouse has a set of five windows, shutters and four window boxes. Getting in and out of the playhouse is made fun thanks to the lovely looking stable style door. This looks more like an actual home than a child’s playhouse. 19 mm thick tongue and groove walls backed up with a round edged frame make this one very strong playhouse that is going to last for a lot of years. The materials used have been picked because they are strong, but then they have been designed with some real class and style to give the playhouse its good looks. 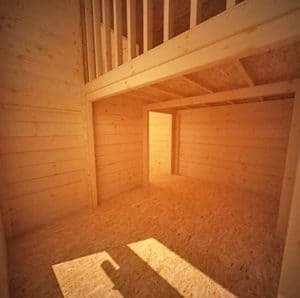 The floor is supported with pressure treated floor joists to ensure it can take the fun and games that kids love to do and in general a lot of care has been taken to make sure the playhouse is child safe. 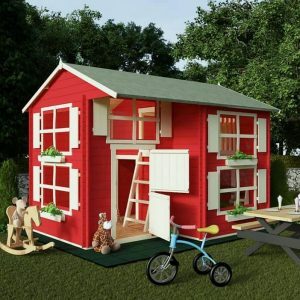 Here we have the BillyOh Mad Dash Annex Log Cabin Wooden Playhouse which if you can take your eyes away from the incredible pictures, we here at WhatShed are going to tell you why this is such a popular playhouse. Ok it looks amazing let’s get this right out of the way. This is by far one of the most impressive looking playhouses we have seen and we have seen many. This looks like some kind of log cabin, cabin in the woods type of house that is most likely going to put your house to shame. What a day and age we live in when our kids have better playhouses than our actual house! Anyway this as you can see is a very impressive structure and it is 10 feet 3 inches wide and 8 feet 5 inches deep so this is offering the kids a lot of room to play. Now this is also a two story playhouse so they even have a small upper level that they can make use of as well. 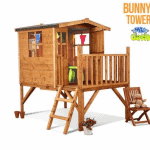 This of course does make this quite a tall playhouse and at its highest point it is over 7 feet tall. This really is a dream house for a child and its huge size means that they will be able to lay it out just the way they want. They have gone for an apex roof that does have an overhang so you will not have the rain running off the roof and down the front of the playhouse. The roof is made from solid sheet boarding which given its size is not all that surprising and we are sure the kids are not going to care that it is not tongue and groove. Covering the boarding, we have some green mineral felt which will protect the boards from the rain and it has a good look to it as well. There is nothing wrong with the roof and it does what it is supposed to do, but you do not really notice it due to how incredible the rest of the design is. 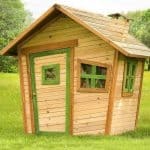 You can tell from the pictures that the BillyOh Mad Dash Annex Log Cabin Wooden Playhouse is one very well made playhouse. The reason for this is that the walls are made from tongue and groove shiplap cladding that is an impressive 19 mm thick. Now practically this kind of cladding is great as it will keep the rain out. But the design is just amazing and the way they have made it look like a log cabin is something that really impresses us. 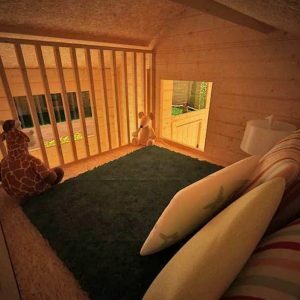 Good looks and high end materials make the walls some of the best we have seen on a playhouse. The walls are very thick, but the frame that is inside here is just as impressive and is going to ensure this lasts for many years and does not become weak. What really impressed us about the frame was the way that they have made sure it has rounded edges which first of all finishes off the inside of the playhouse very nicely. But it also means that there are no sharp edges on the frame so it is also that extra bit safe for your children. Under the kids feet and supporting the truck loads of toys that they will have inside the playhouse is a floor made from solid sheet boarding. Pressure treated floor joists have been used to give the floor that little bit stronger backbone which we were pleased to see. The upper level of the playhouse, the bedroom, bunk room, jail or whatever your kids will call it, is also made from this same kind of boarding. We love the way that the BillyOh Mad Dash Annex Log Cabin Wooden Playhouse looks and it would be a shame to see rot appear. As this will come to you untreated you will have to roll your sleeves up and give it a good coating of wood treatment. The first coating should be applied soon after installation and then on an annual basis a fresh coating should be applied. You do this and you will never have any trouble with rot. The BillyOh range comes with a generous five year guarantee that will cover you against rot as long as you treat the structure on a regular basis. It will also cover you if there is anything wrong with the materials so it is a very good guarantee. The doors on the BillyOh Mad Dash Annex Log Cabin Wooden Playhouse are tremendous. Rather than go for a standard style of door, they have used a stable style door which the kids are just going to love. This door will close safely with a child safe magnetic catch so you do not have to worry about them trapping their fingers in the door. The hinges and the details on the door just finish it off nicely and the size of it means getting in their giant teddies is going to be no trouble at all. Wow, there are a lot of windows on this playhouse. It is amazing how far they went with the windows on this. In total there are five fixed styrene windows on the playhouse. They are all in key areas so there is going to be a good flow of natural light into the playhouse. Now if that was it, we would be impressed. But this is the BillyOh range and they have gone that extra mile. You get a set of five shutters that you can use to finish off the outside of the playhouse with some style. Also included are 4 window boxes which would look adorable with some flowers in them. These extra features are a great example of that extra mile, BillyOh are willing to go. There is no lock on the door as is the case with most playhouses. 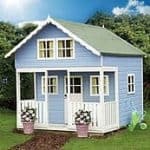 But the BillyOh Mad Dash Annex Log Cabin Wooden Playhouse is a very secure playhouse and the magnetic catch that is on the door makes it easy to open, but it will ensure the door stays securely closed. As there are so many windows on the playhouse, privacy is not something that is offered. If it is getting too sunny inside or the kids are just sick of you looking inside, have a little fun and let them pick out some curtains to cover up the windows. The BillyOh range is one of the best when it comes to customisation as they allow you to pick not just the colour of the walls, but also the trim. Slate Grey, Black and Cream are available for the trim, each at a cost of £7.99. Purple, Pink, Turquoise, Cream, Green, Pale Pink and red are available for the walls and these are priced at £12.99. So if clear wood treatment is not what you want then have a think about adding a little bit of colour. Apart from the extras there is only one other extra to think about and that is the official BillyOh Value Assembly Kit that is priced at £19.99. Which if you have a full tool box is not necessary, but if you are worried that your Poundland screwdriver may not be enough then at least you know this will have all the tools you need to install the playhouse. 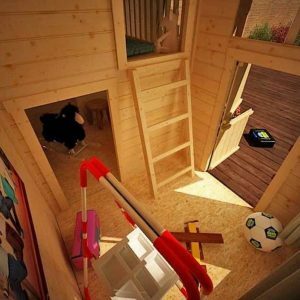 You could argue that a tongue and groove floor and roof would have been ideal, but from top to bottom, we are very impressed with this playhouse and feel the quality is just fantastic. Those solid walls backed up by that impressive frame will really ensure this is a playhouse that lasts. 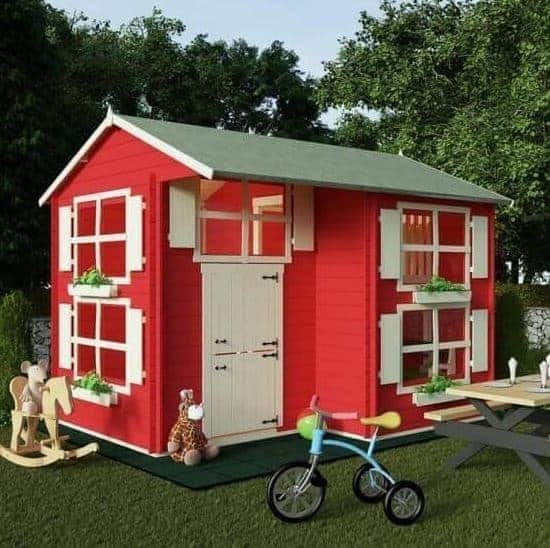 We feel that this is the kind of playhouse that your kids are going to be able to enjoy as long as they can fit inside it. 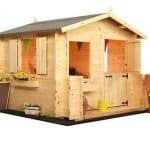 Even when you do not take into account the extra space offered by the upper level, this playhouse is a fantastic size. The kids will have all the room the need inside here. As this is quite large, you are going to have a fair few hours of work ahead of you here. Be sure to have a friend to help and keep the kids away as the constant ‘how long is it going to be’, you will be asked will drive you nuts. 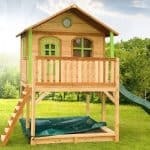 The price is high, but this is a high end playhouse that is made with very good materials and it is huge so really for what you are getting the price is actually very fair. Final Thoughts: We fell in love with the BillyOh Mad Dash Annex Log Cabin Wooden Playhouse right away and had a look to see if it would be big enough for us to move into if we ever get in trouble with the other half. But in all seriousness this really is a dream playhouse for a child. It is huge so when a kid steps in here for the first time they really will feel like they have their own home. We love how the playhouses comes with shutters and window boxes and feel that these little extras make it feel more like a home. The price is high and while some tongue and groove boarding for the floors would have been something we would have liked to have seen, we must say that this is a top playhouse and one we are sure your kids will have many happy years with. Hi Keri, please contact the retailer to ask this question.